This machine, an elderly Kenmore belonging to my Crafty sister-in-law, has been my nemesis for a while. OK, about two weeks. Crafty assured me that last time it was used (some years ago, admittedly) it ran just fine. 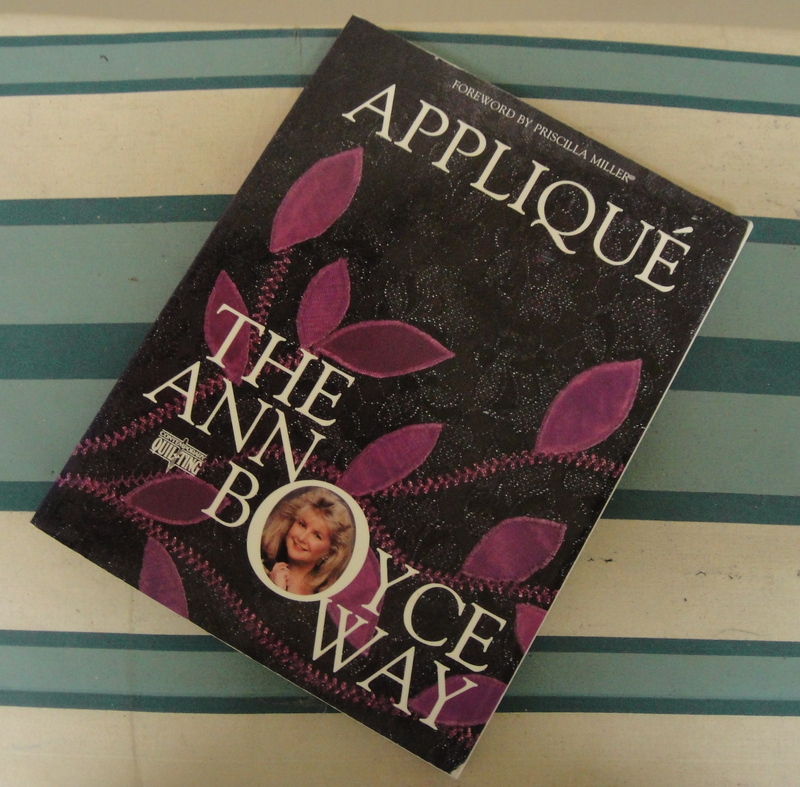 Well, it ran—stiffly, as one might imagine—but it would not form a stitch for me to save my life. I messed with the needle orientation, the threading, the tension. Nothing seemed to work. It was like the bobbin thread was being pulled up at the wrong time to make a stitch. Crafty was, not, as you might expect, thrilled at the prospect of a $100 tune-up for a machine in that “old enough to be crusty but not old enough to be cool and vintage” age bracket. A week or two ago, as I may have mentioned, Crafty and I found ourselves at loose ends in the mall whilst Crafty’s daughter (my fifteen-year-old niece) got her hair done. Neither of us are really mall people, so once we’d exhausted the one small bookstore, we were pretty bored. And it was Remembrance Day Sunday, so nothing but the mall was open. (A pity since there’s three or four little fabric and sewing-related shops within a few blocks radius of the downtown mall) But we did manage to find the tiny remnant of a sewing section in Sears (home, of course, of Kenmore,) and Crafty took the opportunity to pick up a few more bobbins, sewing machine oil, and, most importantly, needles. Well, finally tonight we had a chance to sit down and see if any of those things were the deciding factor. We applied oil (liberally. Stupid oil bottles with the cut-off tip that it’s almost impossible to cut off small enough.) We changed out the needle. 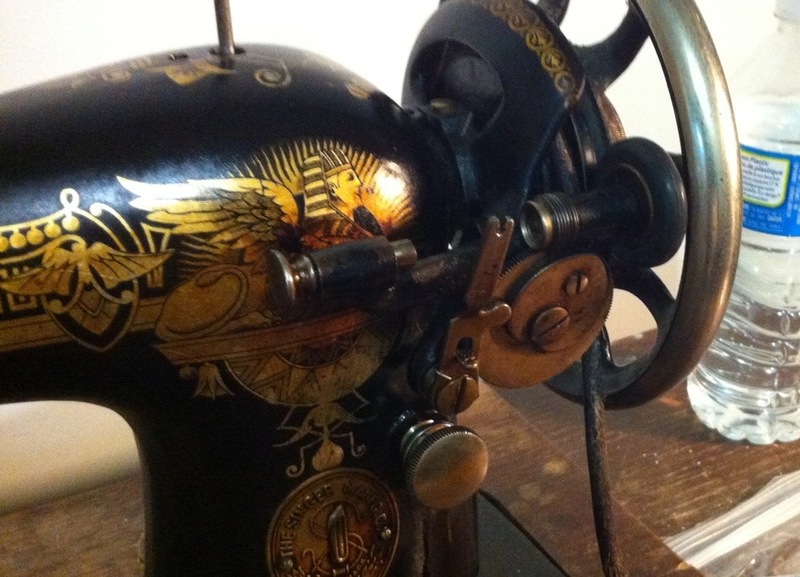 I wound a new bobbin, and threaded her up just exactly like my Featherweight. 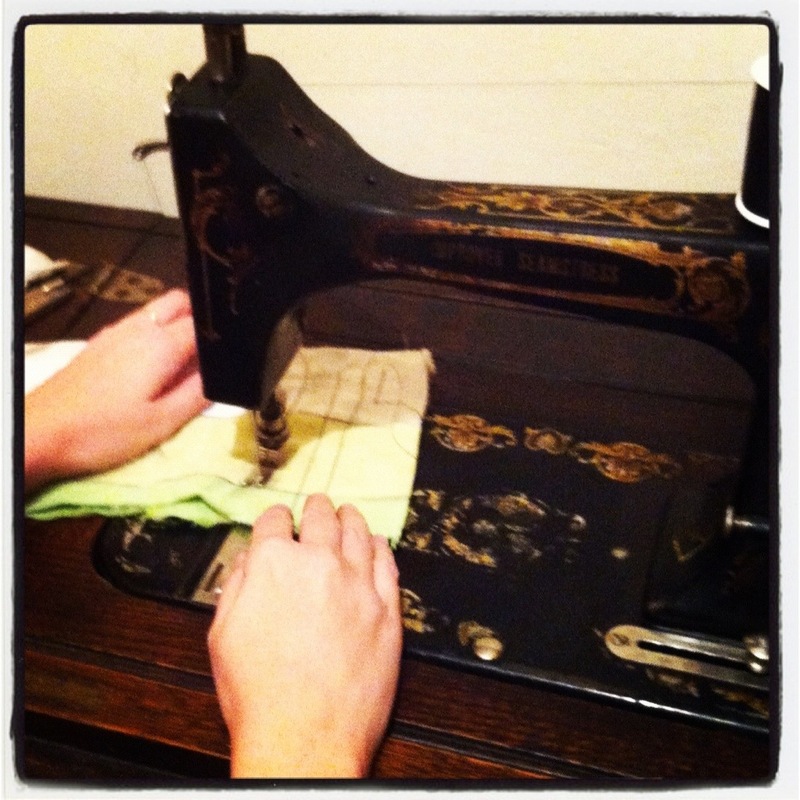 And she sewed. She even (since I thought Crafty might enjoy that sort of thing) stitched free-motion with the feed dogs dropped. BAHAHAHAHA! TAKE THAT, SEWING DEMONS! In the name of all the sewing gods, I banish you! BAHAHAHAHA! *Also, am I the only one who learnt all my Roman history from reading Asterix and Obelix comic books? Anyway, I spent most of the afternoon ignoring my family and messing around with kerosene and oil and rags and an old toothbrush, and at the end of it all, when I should have been taking my kids home in time to have baths before bed, I threaded it all up and tried actually sewing with it. 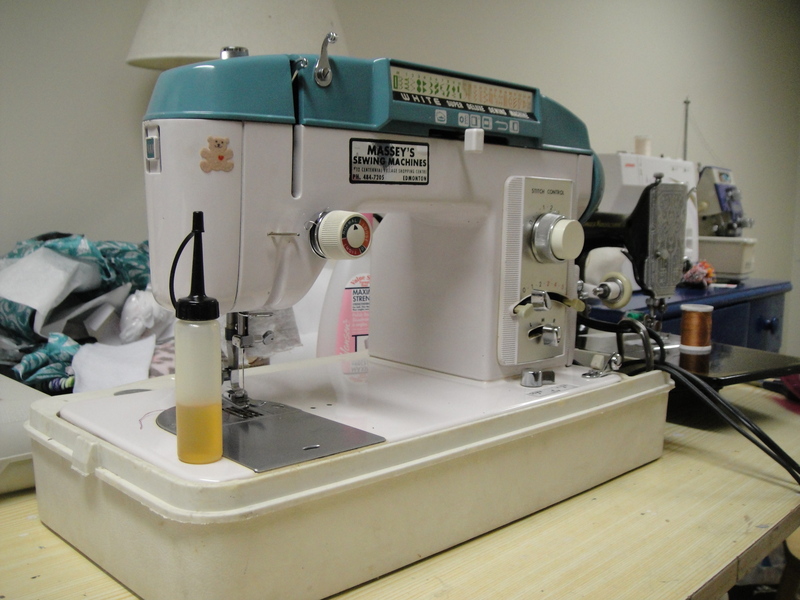 I didn’t have the almost-the-right-manual or any of the threading diagrams I’d managed to collect, so I was actually pretty astonished when I was 1) able to thread the bobbin into the shuttle, 2) put the shuttle in place, and 3) able to (half-assedly) thread the machine. I don’t think I’ve ever felt quite so triumphant about a sewing machine as when I spun the wheel the first time and was able to bring up the bobbin thread. Except possibly a few minutes later when I put the presser foot down and actually (by dint of careful handwheeling) sewed the first few stitches. All is not perfectly well. I still haven’t gotten the faceplate off to clean in behind it. The tension is balanced but high (It’s also allegedly self-adjusting. I’m scared). The top thread tends to break, probably because there’s some sharpish bits in the threading (cheap, elderly thread doesn’t help). The needle is really, really big. They don’t use standard needles. 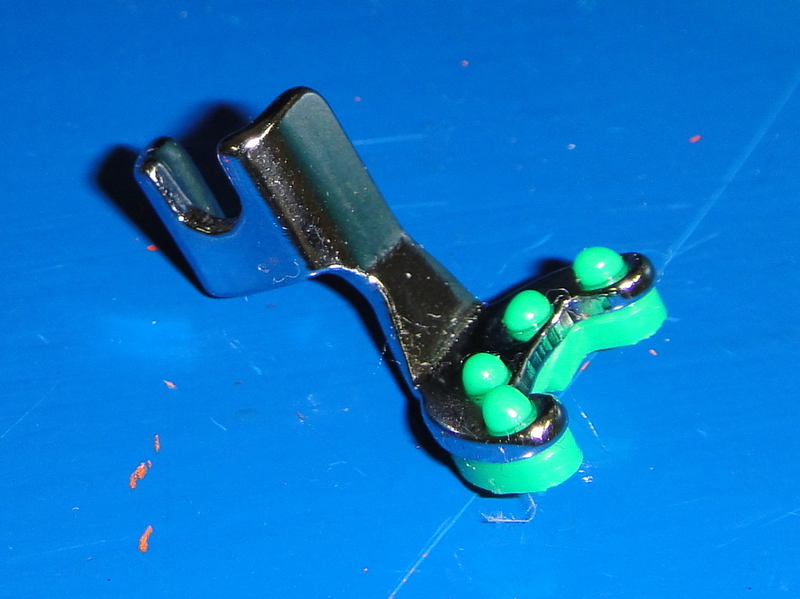 There are about half a dozen in the attachments box that came with the machine, ranging from sturdy to harpoonlike. According to the NSMCO Yahoo group, you can usually use regular needles and just not push them all the way up… we’ll see. I made another “staple” to mend the broken belt, out of wire. It’s not quite as sturdy as the original staple, but it doesn’t seem to give the machine any problems. I used one of the already-wound bobbins, so I haven’t tried to wind my own yet. I am really, really lucky that this machine had bobbins and shuttle and needles with it, because I think I’d have a really, really hard time finding replacements. Note to self: always check if a machine runs, has bobbins, bobbin case, and needles. 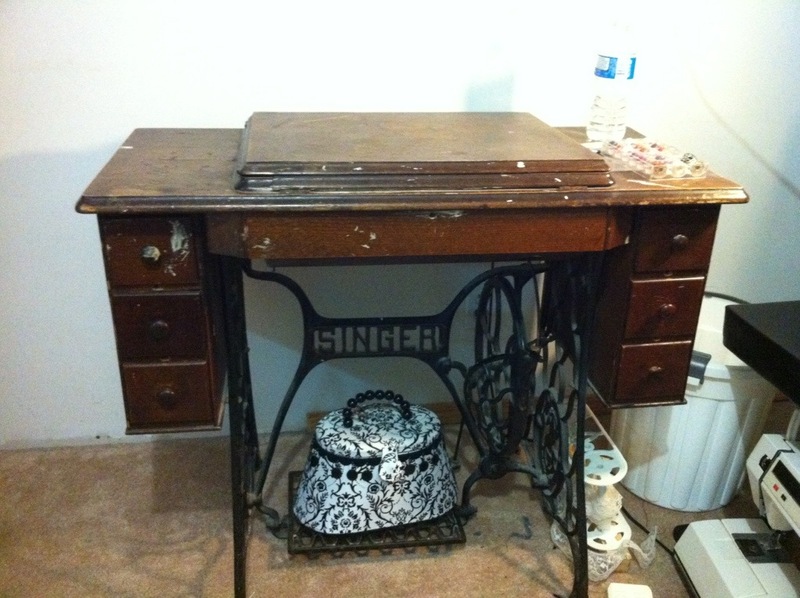 Well, if it’s not some weird old treadle you can probably skip the needles part. 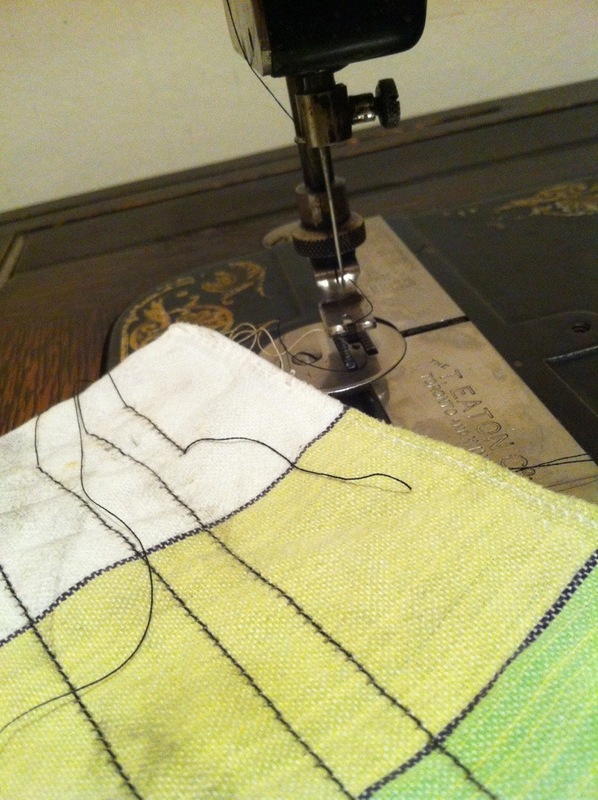 I am still not very good at treadling. I’m terrified I’m not going to get it “all the way over” (if you’ve ever treadled you know what I mean, and if you haven’t, well, if you ever try you will) and make the machine go backwards and then the Elder Treadling Gods will smite me. Now if only I could get the gunk cleaned off the outside. 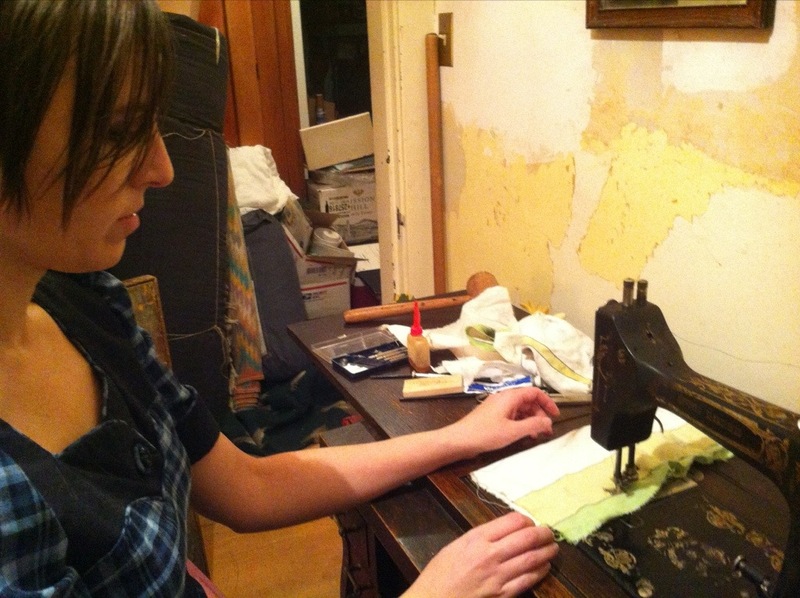 Fortunately, she uses a standard needle, that goes in sideways, exactly the same as my Featherweight. Except that the Featherweight threads right to left, and this one threads left to right. Which was a bit of a WTF moment, but we got past it. I want to thank both Peter and Claire for suggestions of manuals and comparable machines. I actually tracked down a teensy bit of information about Domestic sewing machines here, and they have three different manuals. 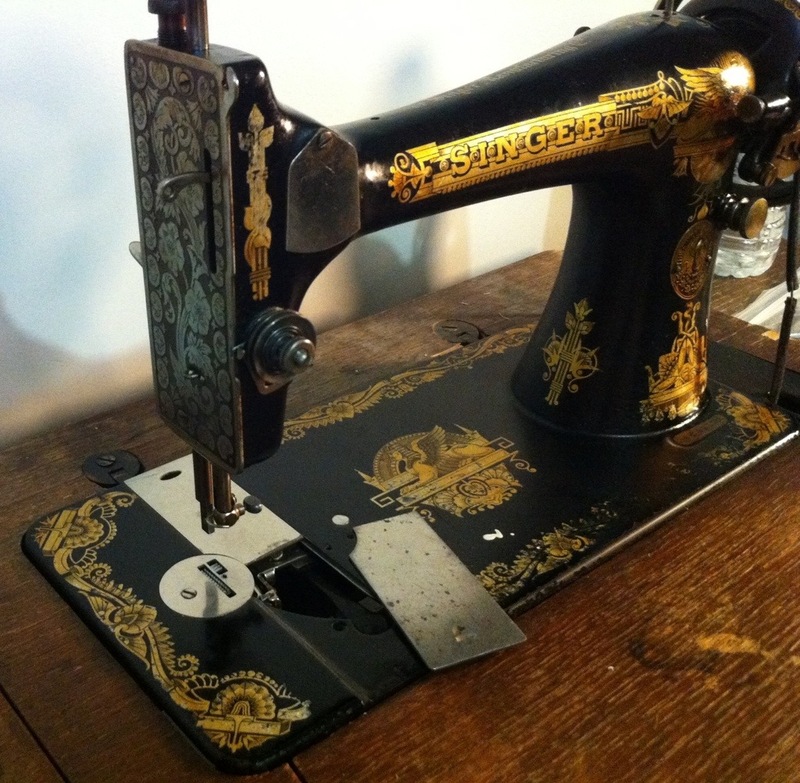 This is the one closest to my machine, although I think it’s a slightly newer (or perhaps just more expensive) version than mine as it has a tension dial rather than lever, and a slightly more advanced-looking stitch length mechanism. There’s no date on the manual, but the font looks sort of 50s to me (I know, so precise). I’m guessing late 40s or 50s for this machine—I’d be surprised if it was as late as 60s (but then, they were still making Featherweights through the 60s). Vintage aficionados care to weigh in? This foot (if it is a foot) does not fit the machine. It looks like a standard low-shank attachment. Other than that, I am confused. Combination Tucker, Edgestitcher, and Top-Braider. I am scared. And very glad for the manual. Motor. 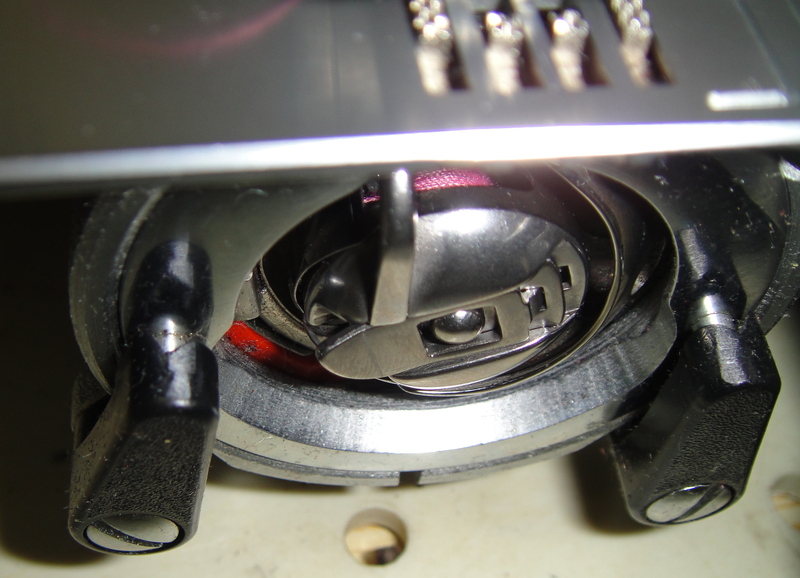 Rather than having a belt, the motor spins this rubber bit which spins the flywheel. However, the rubber’s a bit stiff and worn and sometimes skips or doesn’t start stitching. And the flywheel turns backwards to stitch forwards, which is breaking my little brain. Another view of the ruffler. The ruffler will gather ever 1, 6, or 12 stitches. The Ruffler. 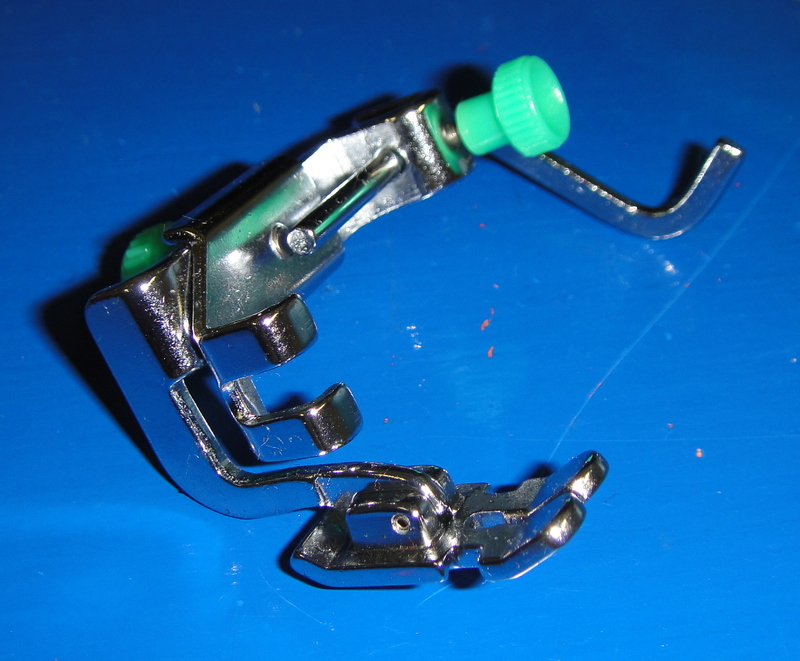 The ultimate scary sewing attachment. Pretty stoked about how well this one works for both ruffles and tucks. Although heavier fabric did not work well at all. Shirring plate and shirring(gathering) foot. Oddly, the manual does not illustrate the two being used together. Hemmers. Only the narrow rolled-hemmer on the right doesn’t work—the needle is a little off-centre in its hole and misses the fold. The others all worked surprisingly well, although the widest one was pretty tricky to get started. Binder foot. This one’s going to take some work. I know there’s tutorials out there for using them… (I found directions for doing some REALLY NEAT bound buttonholes with these… I want to try them! Tension apparatus. Weird to thread. Samples. Hemmers (two sizes), and ruffles and tucks. I’ve never been able to get tucks out of my modern ruffler on the Janome. Quilting guide-bar. 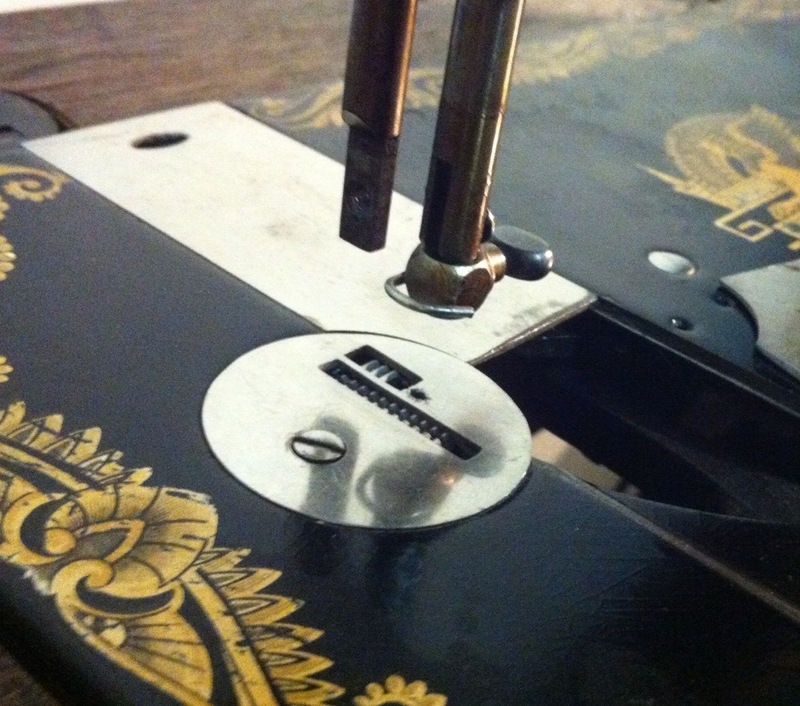 There’s a hole in the presser-foot shank itself to hold this guide-bar. I have just the end inserted, there’s a screw in the back that you have to loosen to actually get it all the way in. 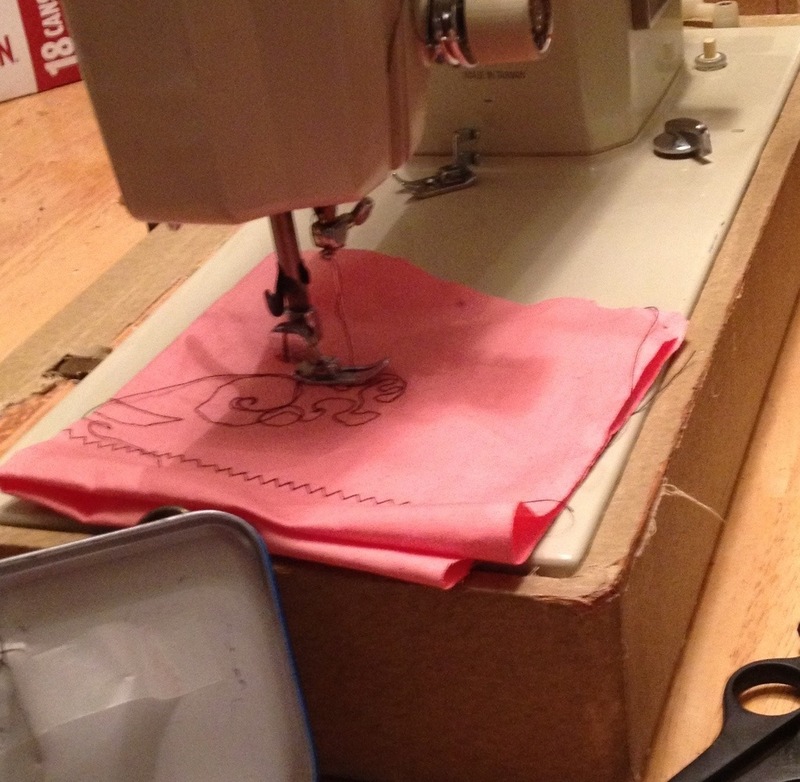 *Toodling around on the yahoo wefixit group led me to this post about sewing machine stitch formation, which basically advocates stitch acceptance. I still think something’s up with the White, though, as the stitch is WAY more zig-looking than my other machines, even with the straight-stitch needle plate in place. That being said, it does a mean zigzag, so I’m not really complaining. Sorry to witter on (I LOVE that word, it’s not part of my native vocabularly but I am totally stealing it) about my new/old machines. I’ll get back to the actual, y’know, making stuff pretty soon. With its very own bobbin case! I swung by Sewing World a day or two after I brought the White home, and they did indeed have the kind of bobbin case I needed. For the low, low price of $14. Yup, half again what I paid for the bloody machine, and two to three times the online prices (although those would’ve had shipping added on. Thanks to everyone who made suggestions!). But it was in my paws instantly (as opposed to some random time in the next month) and supports my local sewing stores, yadda yadda. The manual is available for a download for another $10, which I may get around to shelling out at some point. Anyway, with bobbin in hand I sat down to give her a basic clean. I’m no JillyBe with the full sewing-machine spa, although I wish I was. I just pulled the machine off her base, took toothbrush and kleenex and cleaned out the dust, broken needle bits, pins, and chunk of waistband elastic that were inhabiting it. Then I set to de-fuzzing all the bits of machinery I could easily reach. There was a moderate amount of lint, but not terrifyingly so (I’m sure my Janome was worse off when I took her in for her tune-up last summer). I oiled the moving bits—the previous owner(s) seems to have been fairly heavy on the oil, so there’s a fair bit of sticky residue, but that’s probably better than the alternative, right? More fuzz came out when I swapped the needle-plates to try out the straight-stitch, so I now feel like I have a pretty well-cleaned, well-oiled machine. That and a bit of judicious adjustment of the bobbin tension, and the stitches have improved to the point where the straight and plain zig-zags are almost as good as my Janome’s, although the straight stitch still has a bit of zig or twist to it or something, even using the straight-stitch plate. 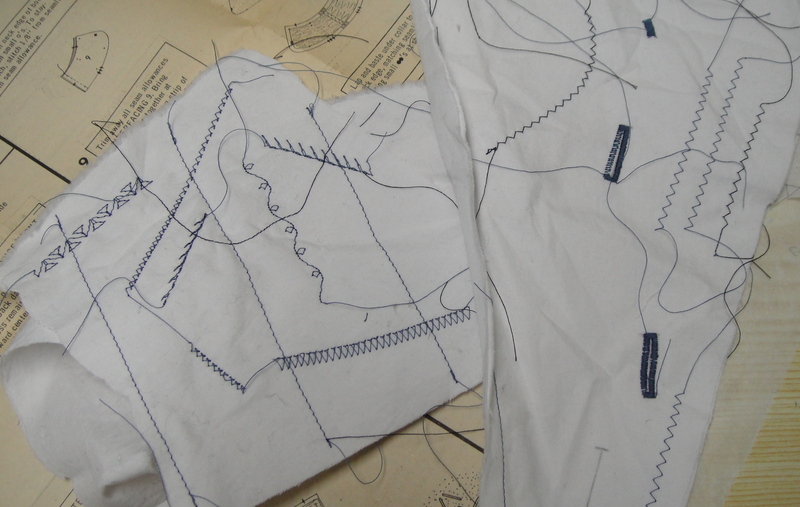 This is why people love their straight-stitch machines, folks. Stitches and zigzags and buttonholes, oh my! While playing with the various fancy stitches and figuring out how to do a 4-step buttonhole (not so hard as I’d feared, especially on plain cotton 😉 ), I determined that the main issue she has is that the reverse stitches aren’t the same length as the forward stitches. The reverse (left) leg of the buttonhole is a long, loose zig-zag if I let the feed dogs do as they will, while the forward leg makes a perfect satin-stitch. (My Janome has a similar issue, although not this extreme) In a buttonhole you can compensate for that by man-handling your fabric, but it also affects the neatness of the fancy stitches. I’m not sure if this is something a tune-up would fix (I’m not super keen to give my $10 machine a $100 tune-up…) or if it’s just something I have to live with. 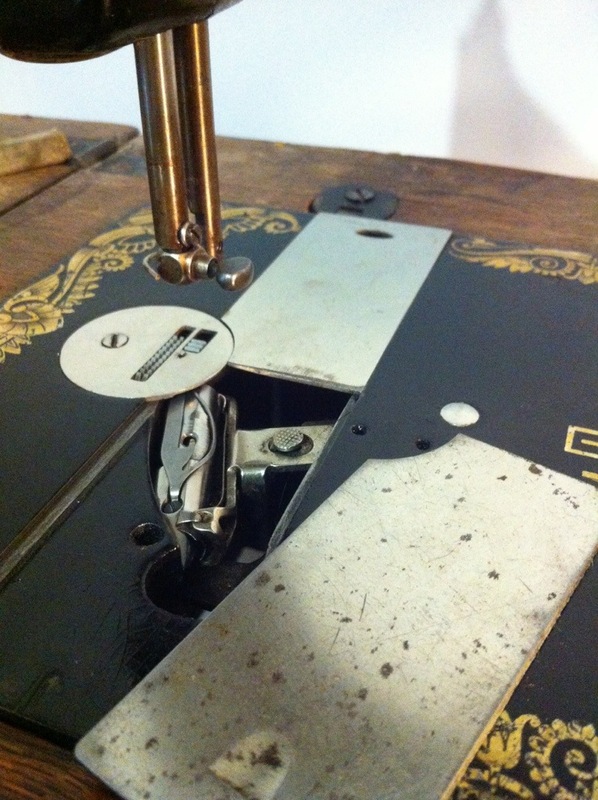 Further sleuthing around the sewing-machine-repair sites/groups may be in order. And this teensy little guy. 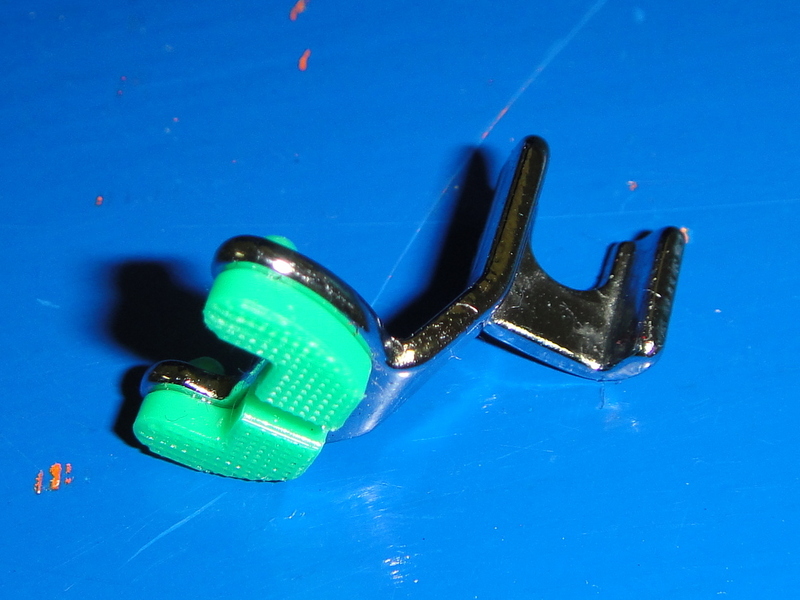 I thought it was some kind of quilting foot, but the plastic bit on the bottom is textured and makes it really hard for fabric to move underneath it, so I’m kinda at a loss about how it should work. So that’s where she stands, folks. I’m going to be trying my hand at (ulp) applique again fairly shortly here, and I think I’ll use this machine as the zig-zags seem a little nicer than my Janome’s. 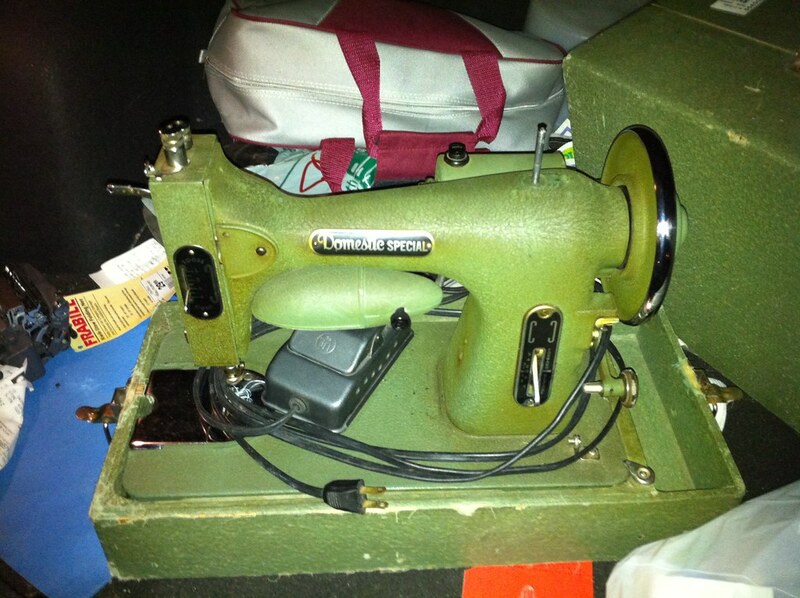 Hello, my name is Tanit-Isis, and I have a thrift-store sewing machine problem. I made it one whole week without buying a machine. The evil masterminds at Value Village had this out to tempt me. What really put it over the top is the little box of accessories—hemmers! binders! RUFFLERS! not shown in the picture because it was in my hot little hands waiting to be pawed through. Also, it has its bobbin-case and everything in place. Wish me luck. The motor runs and things go up and down, but I’m not convinced I can even thread this one. I’ve found threading diagrams for older Domestic models but none exactly like this. 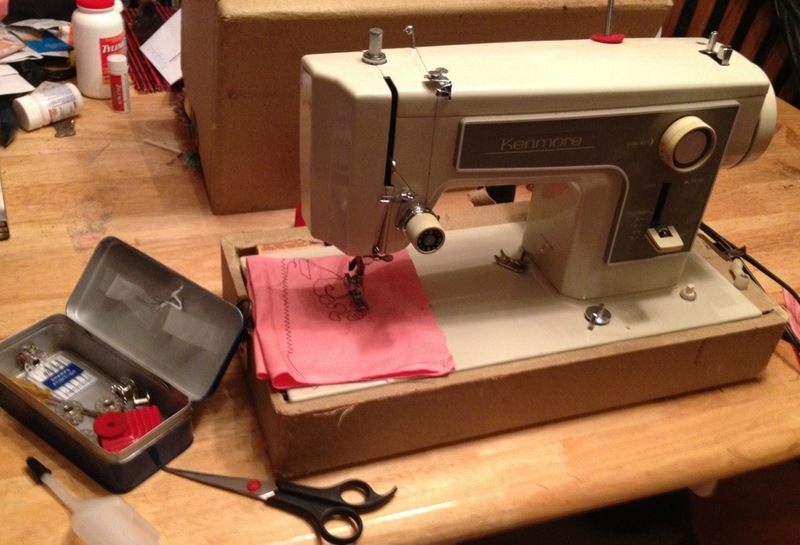 Tyo has dubbed it the “Army Sewing Machine,” and despite giving me well-deserved crap when I showed it to her, spent the rest of the evening opening it up and cleaning it out. Perhaps I can train her to be my very own personal sewing machine mechanic? I got a new bobbin case for the White, as well. I’ll give an update on her pretty soon.